Progressive Web Application (PWA) is a new drift in mobile application development market using web technologies. It is a step towards evolution. Back in 2017, there was a question in every web developer's mind that “What new technology coming for the web in 2018”. In July 2017 “Project Duplo” initiated and 2018 was the year of PWA’s. There are few new projects which are coming this year such as Project Fugu from Chromium. Progressive Web Apps are also supported by search engine like Google with their Mobile First Indexing. Background Sync: It is a new web API that lets the user delay the actions until the user has stable connectivity. It is used in PWA to sync the user data at the background. Geolocation API: It allows the user to provide their location to web application if they want to. For security reasons, taking permission from the user to access their current location or not. Web Push: It gives the ability to the web application to receive or send the message that is pushed through a server to them. Web Application Manifest: It is a simple JSON file that gives meta information of web application. It tells the browser about your web application and how it should behave when installing on users mobile device. The web app manifest usually contains the starting URL, its short or long name, links to icons, sizes, type and location. Responsive Design: It is used so that web application can adapt any screen size and it is easy to use on mobiles, desktops etc. Media API: It is used in web application so that application can access the device camera and microphone. There are alternatives of PWA like Hybrid apps and Apps built on react native but all the application built by them are deployed in app store, but Progressive web Applications are discoverable using search engines so approval from Apple and Google is not necessary. Updates can be released without following the approval process of Apple and Google. PWA gives native application like experience, every visit to PWA increases its user experience. The 2017 US Mobile App report by comScore explains mobile application dominance. The approach was introduced by Google in 2015 from then it become a hot topic for the engineers. Features like “load time”, “add to home screen” and “push notification” increases the interests of user to revisit PWA. Updation of the the PWA is not needed, it automatically updates at the backend. PWA can be shared via sharing the URL with others. When an organization built an application they need developers to maintain that application and that task is very lengthy as well as costly. PWA is a very cost effective, maintaining the web application is a less time consuming task and the manpower needed is also very less. TIP: Visit the website and website will prompt “Add to Homescreen” click on it and PWA will be added to your homescreen. Push Notifications: The server deliver a message to service worker which updates the local state and unveil a notification. 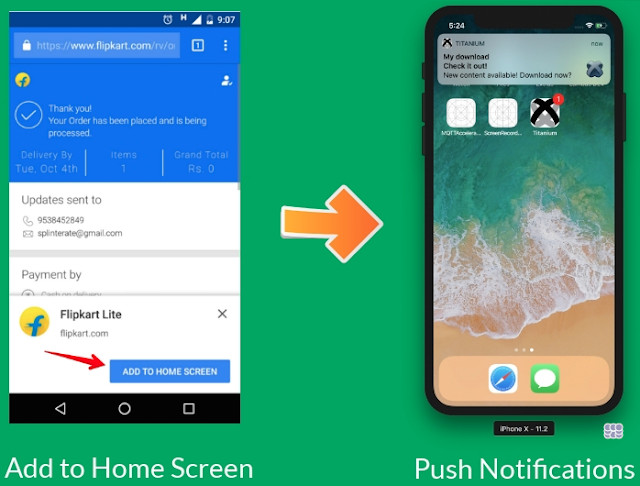 Push Notification is an exclusive way to remind the user about the web application and unfinished transaction or tasks which he needs to complete, but notifications should be relevant otherwise user can even stop using the web application. Push API helps in triggering the notification but service worker is the main actor in this for handling the message comes in and goes out request. Don’t waste time of the user for the work which user can do afterwards as well. What are you notifying them should require an action like replying to someone or complete a transaction. The user can be frustrated if the work related to the notification doesn’t work. Some of the PWA projects and their successes are Flipkart, Pinterest and Tinder. ∙ Flipkart: Flipkart realize that 60% of their users who had uninstalled their application have started using their PWA. ∙ Pinterest: Pinterest saw that time spent by the users went up by 40%, user generated ad revenue went up by 44% compared to old application. ∙ Tinder: They analyzed that users are swiping and messaging more than before and session times was longer as well. Finally, there are many features which have been already developed and many more are coming such as Web Bluetooth API for interacting with hardware, WebVR for virtual reality and Web GL2 for high speed gaming. Weekly active web users have increased 103% year-over-year, overall with 156% increase in Brazil and 312% in India. Don’t Stay Away from PWA.